Your horse's hocks are the knee-like joints that are located in the middle of his hind legs. The hock allows the leg to bend significantly when your horse walks and is similar to your elbow in function. Your horse can develop sores on his hocks. Hock boots are designed to help prevent uncomfortable sores from occurring and causing your horse pain. Hock sores form when the skin on your horse's hocks becomes rubbed raw. 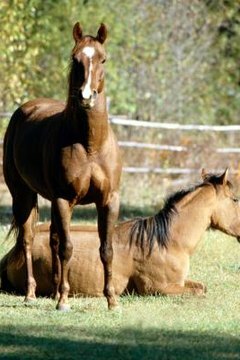 The most common cause for hock sores is a horse repeatedly laying down in a soiled stall or on rough ground. Hock sores can range in size and severity from a small area of bare skin where the hair has rubbed out to a severely infected, bloody area located on the hock. Hock sores can lead to discomfort and lameness. Hock boots are designed to prevent hock sores. Since the majority of horses do not regularly get hock sores, hock boots are more of a special order item than a commonly used piece of equipment for most horse owners. Hock boots are necessary only for horses who have shown a propensity for development of these sores. Hock boots are a padded, wrap-style horse boot that is placed around the hock and then tightened as necessary using hook-and-loop fasteners, snaps or buckles. Hock boots should be snug enough to stay in place without being so tight they restrict motion or interfere with circulation. They should be checked regularly to make sure they are not rubbing your horse's leg or causing boot sores to develop. Using hock boots to prevent hock sores tends to provide a temporary solution to the problem. You must inspect your horse's environment thoroughly to determine why he is suffering hock sores in the first place. Hock sores can be caused by using too little bedding, leaving your horse in a wet or otherwise soiled stall, or even just using stalls with concrete or otherwise rough flooring. Adding stall mats and additional bedding, and cleaning the stall more regularly can do a lot to help prevent hock sores from developing as well as help your horse's current hock sores heal successfully. Pro Equine Grooms: What Can You Do for Hock Sores?